7 March 2019 Unlocked content from the archive. Grandfather used to live happily on a farm, nearest the tallest tree on a mountain. Now he lives with his family in a small apartment in a crowded city and he is silent and sad. When his grandson, the narrator, takes home a tiny tree he’s rescued from a footpath, Grandfather is at first dismissive, but gradually becomes involved in helping his grandson tend to the tree. Christopher Cheng’s Chinese heritage informs this book and it’s a privilege for us to be included as readers. 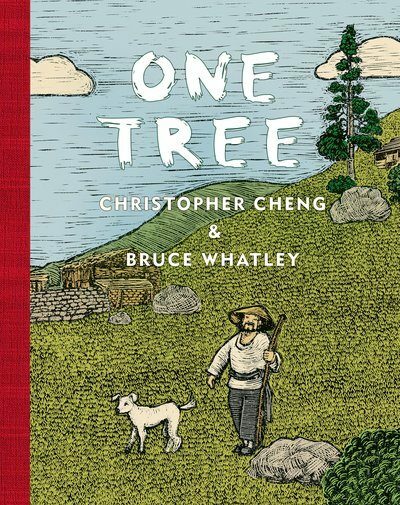 One Tree acknowledges the old ways while being realistic, but not negative, about modern life. It shows there are always possibilities for change and it emphasises how lucky we are to have elders in our lives—and how important it is to listen to them. Bruce Whatley’s illustrations are wonderful. Whatley uses a new technique that has the appearance of linocut pictures, although it has been achieved digitally. Not only do the pictures extend the text, but they deepen it, and it’s this technique that gives the story an extra layer of interest and meaning. We follow Grandfather’s life, with its obvious changes, but we also see that renewal and regeneration are possible for both people and their environments. This is an outstanding, life-affirming book that will surely stand the test time. It is recommended for those aged five and up.